Join the BUGS Team! Post on the internet along with us to fight White Genocide! With the hearing set for tomorrow our team at FWG saw the need to make our pro-white position known to the Judiciary Committee. Ken has faxed the following to ALL of the REP’S on the Judiciary Committee and snail mailed the same thing to the Hearing Room. Jeff has written the following Communique which is posted on FWG. The following is a communique we have sent to staffers of the Republican members of the House Judiciary Committee. The purpose is to make our pro-white case and and also in the hope they may use some of our talking points. We also sent ALL committee members the US law on genocide (18 U.S.C. § 1091 ) and Bob Whitaker’s mantra. During the upcoming Holy Inquisition of the Religion of Political Correctness to be held April 9, 2019 in the House Judiciary Committee, your white voters will be watching to see whether you advocate or support any action which singles them out for censorship, whether done by you directly or indirectly through social media as a result of federal legislation. If you do, why should any of them vote for you? Pro-whites have already been convicted without ever having a chance to defend themselves in court. They never invited anyone to testify on behalf of white people. This is just a sentencing hearing. But the anti-whites never made the case as to why pro-white advocacy is uniquely evil. Many political positions have violent advocates. If you outlawed discussion of anything that had been horribly misused historically, anyone who talked about the distribution of income would be in prison. Stalin used the question of the distribution of income to kill tens of millions, and Mao Tse Tung killed even more. Would it be all right then for a gang of thugs to show up and riot every time someone came to the campus to discuss income redistribution? On July 7, 2016, in Dallas, Texas, Micah Xavier Johnson murdered five police officers and injured nine others. According to Dallas police chief David Brown, Johnson “stated he wanted to kill white people, especially white officers.” In an interview with Wolf Blitzer July 8, 2016, Hillary Clinton said “I’m going to be talking to white people. I think we’re the ones who have to start listening to the legitimate cries that are coming from our African-American fellow citizens.” There were no calls for censorship of black lives matter or any political position they favor. There were no congressional hearings on the effect of anti-white speech inciting violence against white people. No one is saying we have to listen to the legitimate cries of white people. On June 14, 2017, in Alexandria, Virginia, James Thomas Hodgkinson Shot Congressman Steve Scalise and also shot Matt Mika, Crystal Griner, and Zack Barth. Hodgkinson was a Democrat who was, according the Virginia Attorney General “fueled by rage against Republican legislators”. There were no calls for censorship of Democrats or any political position they favor. There were no congressional hearings on the effect of speech inciting violence against Republicans or conservatives. Why is only pro-white advocacy being singled out for censorship? Right-wing speech is routinely blocked at universities due to threats of violence from leftist thugs. The threat of violence ALWAYS comes from the left. Universities are engaging in political censorship at taxpayer expense in violation of their tax-deductible status. They are censoring YOUR constituents. They are making it harder for YOU to get elected. Why don’t you hold a hearing on university censorship? Tyranny is free speech with exceptions. In Communist countries the word “fascist” is used all the time. In fascist countries almost all opposition was called “Communist.” That is exactly the way “racist” is used today. Freedom of speech is always suppressed with the excuse that it might cause trouble. Tyrannies like Nazism and Communism always used somebody else’s totalitarianism to justify their own. In fact, no suppression of free speech has EVER used anything but screaming some label to justify itself. If no one stands up for the right of a person to openly talk about the disappearance of the white race we see going on around us, how long will it be before Political Correctness condemns the discussion of other issues? Stalin’s Constitution of 1936 declared more freedom than did any US constitution, state or Federal. But those announced freedoms were limited by one small problem: No one could exercise them if they would interfere with Purposes of the State. Alexander Solzhenitsyn wrote The Gulag Archipelago about his nightmare years in Soviet Death Camps. He was sent to the Gulag for writing private letters that were critical of Stalin. It was one of tens of millions of cases where Soviet Freedom of Speech had an exception. By that definition, everybody has free speech. Slaves were permitted to say anything they wished, so long as it did not interfere with the will of their masters. As with Stalin, the so-called “right” to free speech is now simply the right to speak if it doesn’t cause trouble. 3) Stand in the way of the purposes of society. Those three exceptions are all accepted by America today, by the left and by the respectable right. Calling disagreement “hate” is childish. Truth doesn’t cause violence, censorship causes violence. 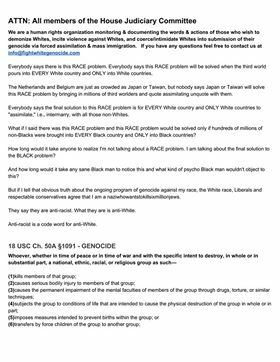 There is currently a global genocide of the white race. e) Forcibly transferring children of the group to another group. Force blending meets the definition of genocide under Article II (c). Force blending meets the definition of genocide under section (a)(4) of 18 U.S. Code § 1091. The United States not only has an obligation not to engage in the crime of genocide, it is obligated to take steps to prevent genocide. You can’t be a separatist and a supremacist. You can’t supremacize people who are NOT THERE. If race doesn’t exist, what’s diversity? If there’s no such thing as white people, what’s white supremacy or white privilege? We see that every excuse given for singling out pro-white advocacy for censorship is spurious. Whites, in fact, are under attack globally. They are being subjected to harassment, censorship and violent assaults. They are the only group being denied the basic rights to homelands and self-determination. They have every right to speak out against their genocide. Racial politics is the inevitable result of multiracialism. Anyone for multiracialism is necessarily in favor of racial politics. Anything governments REQUIRE you to believe is a lie. Anything governments REQUIRE you to disbelieve must be true. Perhaps you think your white voters will remain in a demoralized, self-hating state forever. Perhaps you believe you will never be hauled before an international tribunal for support of white genocide. Perhaps you believe you can continue to dog whistle to your constituents then stab them in the back the moment you take office and they will nevertheless continue to vote for you. But what if you’re wrong? George Orwell explained in his novel 1984 that a rational society must include the right to say that two plus two equals four. It must include the right to say what is true. In 1799, the Federalist Party passed the Alien and Sedition acts which largely outlawed any criticism of government policy, even if the criticism was true. In 1800, the people voted them out and soon the Federalist Party ceased to exist. The PEOPLE, not the courts, got rid of that whorish doctrine, “The truth is no defense” in America. We’re human rights activists calling attention to the crime of genocide being committed against the white race. The crime of genocide was codified under international law by General Assembly Resolution 260 (adopted Dec 9, 1948 in effect Jan 12, 1951), The Convention on the Prevention and Punishment of the Crime of Genocide. This genocide is being carried out by means of mass non-white immigration and forced assimilation in ALL and ONLY white countries the goal of which is to force blend ONLY white people out of existence. Anyone who objects to this crime is subject to harassment, intimidation, violent acts and threats of violence, psychological terrorism, job loss, and prison terms. We DEMAND an open and free discussion of white genocide without threats of attack from screamers, thugs, or thought police. We DEMAND a worldwide repeal of all laws that make it illegal for white people to speak out for their racial interests. We are against white supremacy in all its forms, including the notion that white people have a moral obligation to take care of every race but their own. We unequivocally condemn, denounce and disavow the use of violence to achieve political ends. Please reach out to them and share the communique. This entry was posted on 04/08/2019, 12:52 pm and is filed under Coaching Session. You can follow any responses to this entry through RSS 2.0. You can skip to the end and leave a response. Pinging is currently not allowed. The purpose is to make our pro-white case and and also in the hope they may use some of our talking points. We had great success with the Judiciary Hearing. That’s awesome @White&Normal!! Thank you for clipping those!! But it can’t be done directly, like this. These silly folks at the congress only expose their own actions and spread “grey goo,” if anything.